You are bidding on a rare chance to traumatize a treasured friend or relative with baffling, mind-numbing, mystery correspondence from abroad. The postcards will not be coherently signed, leaving your mark confused, guessing wildly, crying out in anguish. Your beloved friend or relative will try in vain to figure out who it is. Best of all, it can’t possibly be you because you’ll have the perfect alibi: you’re not in Poland. You’re home, wherever that is, doing whatever it is you do when not driving your friends loopy with international mischief. Your target will rack their brains in the shower. At dinner. During long drives. At work. On the golf course. 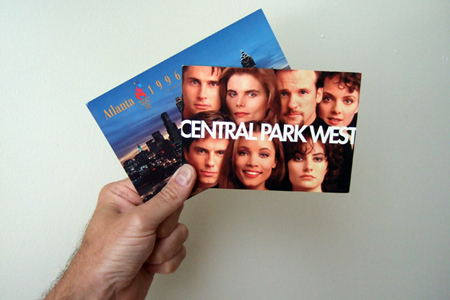 To add to the sheer confusion and genuine discomfort, one missive will be on an original promotional postcard announcing the 1995 television premiere of Central Park West on CBS. Another will be a postcard celebrating Atlanta’s disastrous hosting of the 1996 summer Olympic games. Your mark will be at a complete loss, desperate for answers, debating contacting people he or she hasn’t talked to in years. When you decide to end the torment is completely up to you. If you can, I recommend owning up on 1 April 2008 – giving you nearly half a year of joy and a George Clooney-esque level of prankage. If you can’t hold it in that long, I totally understand. Buyer should probably understand that on a few occasions the Polish postal system has proven itself to be somewhat lacking: Christmas cards have arrived on Easter and vice-versa. If not all cards arrive promptly, one may blame Poland’s communist past.